ESPN+ To Serve As Exclusive Digital Home For Every Game Of The 2019 USL League One Season. 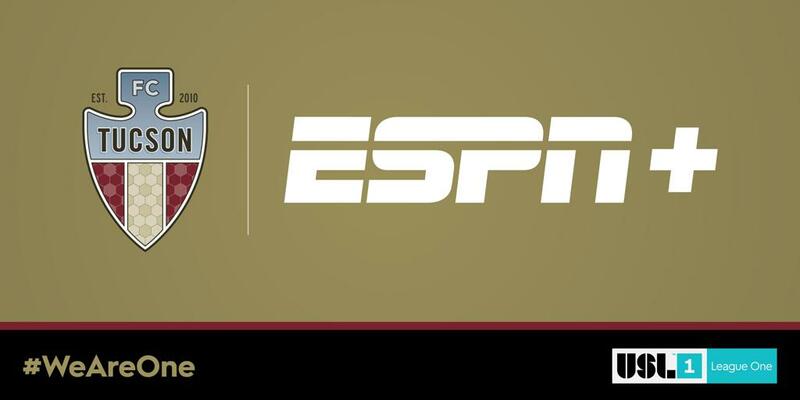 FC Tucson will have its inaugural professional season streamed on ESPN+, following a landmark agreement announced between The United Soccer League and ESPN Wednesday. The agreement will bring every game of USL League One’s inaugural 2019 season to ESPN+, the leading direct-to-consumer sports streaming service. USL League One is the new United States Soccer Federation-sanctioned Division III league. Its regular season kicks off the weekend of March 29-30 and will conclude with its postseason in October. The addition of League One’s 2019 regular season and postseason schedules to the platform, results in more than 700 games across the USL Championship and League One on ESPN+ in the 2019 season. The games will be produced by USL Productions, the league’s state-of-the-art broadcast production, broadcast and distribution facilities with VISTA WorldLink in south Florida. Launched in April 2018, ESPN+ has already surpassed two million subscribers and established itself as a must-have for soccer fans in the U.S. It offers hundreds of top-level soccer matches from around the world, including Major League Soccer, UEFA Nations League, Italy’s Serie A, England’s FA Cup and English Football League Championship and League 1, the Dutch Eredivisie, Australia’s A-League and more. The United Soccer League will enter its fourth full season of media rights agreement with ESPN in 2019, with contests from the USL Championship having aired regularly on ESPN’s platforms since the start of the 2016 campaign. Last November the USL Cup aired on ESPN2 for the first time as Louisville City FC claimed its second consecutive championship with victory against Phoenix Rising FC.